// Hobbies & Special Interest // Archive by Category "Martial Arts"
C’mon how could that be stopped right away? 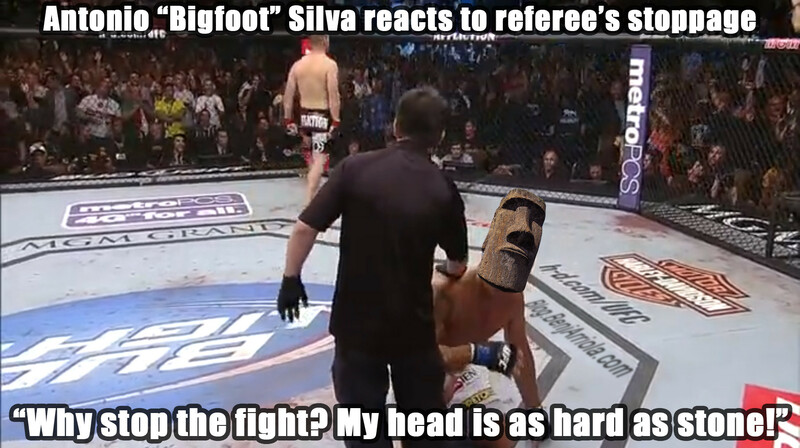 Antonio “Bigfoot” Silva has a face as hard as stone like the statues at Easter Island! Antonio “Bigfoot” Silva with a face as hard as Easter Island status. Fight was stopped prematurely. This is my take of the challenge round by round. Both gave a good share of punches, Manny Pacquiao clearly showing the faster hand speed early on and just outpunches David and makes it faster to the punch. After the round, Pacquiao’s coach Freddie Roach says to stay away from the inside. While Diaz’ coach is advised to stick the jab. A straight hard jab and not coming from the outside. 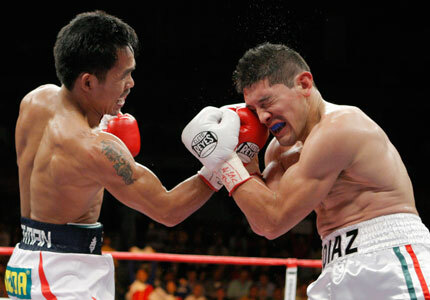 Another round by Manny Paquiao again, Manny Pacqiao Pacquiao showing consistent hand speed where HBO commentators had some doubts he can maintain the pace up to the later rounds and when tired, Diaz may take advantage from there. Although Manny Pacquao had a lot of punches, Diaz had a nice tight close guard that not all punches of Pacman were going in, but still a good set of punches get in. Diaz gets a cut above the right eye from this round first suspected from a body shot upper cut combination. David gave a few punches but did not significantly shake Pacquiao in any way. I am a fan of Kazushi Sakuraba because of his poker face he has when fighting. Although dangerous he has this expressionless face without much rage and likes to acknowledge the skills of his opponent even if he wins or loses a fight. Mainly a wrestler, he has fairly enough striking skills. But I found it sad watching him loose to the animal like Vanderlei Silva in all 3 fights they had in the past. Silva is like this beast that is going to eat you alive. Although one of Silva’s popular fights was when he lost by knockout to Vitor Belfort with Belfort’s extreme punching power and fast hand speed. You win some, you lose some, but Silva’s history has proven he is one hard person to match in the octagon and PrideFC. Being a practitioners of several martial arts myself, I like watching UFC and PrideFC as well as reading and interacting with others like in UFC and Pride forums. Mirko Crocop on the other hand is this lean mean Russian fighter, formerly in the armed forces with great striking skill and precision. Crocop is popular for his high left roundhouse kick to the head that has already knocked out many opponents in the past. Brandon Vera is a Filipino? I am out of shape. Although I love Taekwondo, I am sure if I go back to the Taekwondo studio where I used to go to here in San Diego, they will just beat me up. *LOL* Because they expect me to be good, but that was 2 years ago and a lot can change in 2 years. I think if I go back, I can’t do anything I used to do and I need to train privately first and hide from the group before going back so I am prepared when they decide to beat me up. But now I work downtown, so travel time is a bit more, and when I get home, the Taekwondo classes will nearly start and it will just be a hassle chasing the time for the taekwondo classes to start. So I might as well go to the City Boxing gym in downtown San Diego. It would be near work and I signed up on their 30 day trail on their website. So I get to try everything out first for free. Hehehe. Upon visting their site, I saw they have a good line up of trainers that include UFC fighter Brandon Vera. Although I am not 100% up-to-date as I was before in the MMA world, I decided to do a quick YouTube on Brandon Vera to check him out. And the guy posting the video and in some comments say that he is a Filipino. His dad is Pinoy and his mom is Italian. Well I don’t know if that’s true. Let’s see when I decide to go there myself. When I was in the Philippines, many Taekwondo jins like sewing on their Dobok (Taekwondo uniform) a patch of the flag of the Philippines. Mainly not part of the Philippine pride, but had a psychological advantage knowing that the Philippine National Team was feared since they are really good. Have a Philippine Flag Patch on their uniform is like instilling fear in the opponent giving them a notion that you are comparable with the caliber of skills the national team has since most of the time they have the patch of the flag of the Philippines sewed on to their uniforms as they compete often internationally. Today I am in the US, and I guess every Taekwondo jin (practitioner) from the Philippines will agree that it is really different here in the US compared to the Philippines. And some people know that, where the Philippine flag can do you good again doing the same psych war. LOL. Anyway, if you are looking for a Philippines Flag Patch , I found mine online. I have never really fought a person face-to-face in real life. But I have joined several Taekwondo competitions already. And after watching this taekwondo video, it kind of pumps me up to start training again. Maybe even just a punching bag, some boxing gloves will be good enough to get started again. It would be really great if there was a punching bag at work and in-between breaks, I can get to punch and kick the bag. But right now I am totally out of shape that I need to work on my cardio vascular endurance first and start running again. 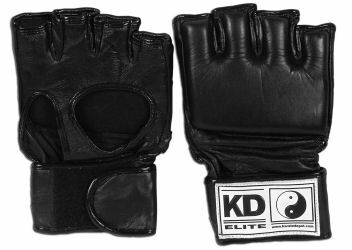 In the Philippines I have trained in Taekwondo, Aikido and Jeetkunedo. That was way back 1991 to 1996. Those years were the years of my peak performance. Maybe some of you have seen my pictures in Friendster or elsewhere where I’m in a Taekwondo uniform wearing a blackbelt. That was right after a fight in one of the competitions I joined in the Philippines. But I am not a Blackbelt. Where each colored belt in between white and black has a high and low ranking. In the Philippines I am high redbelt, but always competes wearing a blackbelt and has won several matches against real blackbelts. But I never reached the finals though in all Philippine competitions I joined. When I got here in the States, I was accepted as a brown stripe belt. Like in the Philippines I was two belts away from blackbelt. So I basically have the same rank. But one difference here is I never compete against blackbelts here since competitions are by age, by belt and by weight. Which is a good thing for me especially that I am already 31, and the last time I did Taekwondo was in 1996. Until I started Taekwondo again when I came here to the States last July 11, this year. Today is my promotion test for Red Belt, which is low brownbelt in the Philippines. Promotion test here are different, I do punches and kicks, self-defense techniques, forms and breaking. In the Philippines, promotion test are concentrated on sparring. There is no breaking though in the Philippines, but I am pretty confident I can break the blocks of wood today. Especially the kick I’m going to do for my test is a flying side kick. And a flying side kick has a lot of power in it so breaking should not be hard. Wish me luck! Although I won 2nd place in the 10th Annual San Diego Taekwondo Championship, Master Min still wanted me to join the California Open which I think I am not prepared for yet because I need to build up my endurance again. But when I said I am not sure I want to join, he has not reminded me to join again. Sergei, one of my friends here at the taekwondo studio wants to join and has been inviting me join too, but I really think I will build up my endurance and is working on a three month program with 24 Hour Fitness to develop peak sports performance level to augment my taekwondo skills. Last September 11, 2004, I was caught on tape. I was with someone in a very tiring act. We were both going full blast but I ran out of gas earlier. The cameraman, Mr. William Pintos was filming something else but when he saw us, he took a video of us too. What I did in this video is a lot more tiring than what Paris Hilton did in her videos that are circulating in the Internet. You will need Windows Media Player by the way. I uploaded a small 2.7MB video, if you want to see a clearer copy, I got a 9.3MB version of the clip too. I actually just captured this video from a VHS tape and if you watched the whole tape, there is actually many of us, all doing it at the same time. Since Champion Taekwondo Academy had the most wins on the recently held 10th Annual San Diego Taekwondo Championship, we kind of had a simple awarding ceremony. I supposed to arrange these and add captions, but it’s 11:00pm, I need some sleep. Master Min asked Me, Ryan and Sergei to join the California Open Taekwondo Tournament this November. I do not know if I supposed to be happy or not. I guess it is an honor to be asked by your teacher to attend meaning he see that you have potential to make it, but I can already picture the extra training I need. I really have to jog every weekend to get my edurance up since my edurance is my number weekness right now. Second is my flexibility. Third is my strenght. And when it comes to competition strategy, I have a lot of that. The problem is, strategy is nothing if my body can’t do it anymore. Although I got 2nd place in the last tournament, I still do not feel the way I was in 1994 to 1996 when I was training under DLSU. There are a lot of things I used to do that I am having a hard time doing now. – Thanks to all those who congratulated me by email. – Thanks to Sir Adrian, Received the payment already in the bank. – Thanks to Sir Josiah and Ma’am Chiqui, Received payment also in the bank. – Hi to Marcia, Hi babe, I hope Jamie is feeling better. Hi Dawn and Rain. Practice ka din mabuti Rain sa Taekwondo ko. Jamie might go into taekwondo soon sa Pink Toes sa Fairview. Janet always wanted to go into taekwondo, sama-sama na kayo, babe ni Jamie and Janet sa pink toes. Pagpumasok na kayo, kwento mo sa akin sino instructor dun. – Eric B. tumawag ka daw sa bahay? Bukas may taekwondo ulit ako, tawag ka kahit mga 10pm. But if puro ring ng ring, naka call-wait yun at naka connect sa Internet. You could chat with me on AIM, YM, MSN, ICQ. Information is show on top of this page.